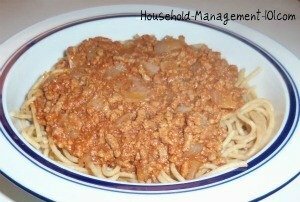 Here is a quick and easy spaghetti meat sauce recipe we often use on busy nights to get the family fed without lots of ingredients, pots, pans, and clean up. When I'm doing my weekly meal planning, I always look at my calendar to see what the family has going on during the week. If I notice a really busy evening, this is one of my family's go to recipes that we often fall back on. You can make it, from start to finish, in about 30 minutes. The sauce is made all in one pot, so there are not as many pots and pans to clean up afterward. My kids absolutely love, and devour it. Before I married my husband I had never had what he calls "church dinner spaghetti," and which I call spaghetti meat sauce. It is pretty thick, hearty and filling. My mother-in-law actually also uses it, with basically the same recipe, and puts it on hot dogs for family get togethers, and then we call it "hot dog chili." One of the beautiful things about this recipe is its simplicity. Just combine all the ingredients above (except the spaghetti) into a pot, and bring everything to a boil. Then, turn it down to simmer and let it cook, stirring occasionally, until the onions turn translucent and the meat is thoroughly cooked. This takes approximately 25 minutes. As it cooks the sauce will turn from red to brown, which is another way you know when it is done. You don't have to precook the meat or onions, or anything, just cook everything together! Simultaneously, while the sauce is cooking bring water to a boil and cook your spaghetti. Once the sauce is done just ladle it over the spaghetti and serve. This spaghetti meat sauce recipe makes enough for my family of 5, plus a serving or two of leftovers for the next day. If you have an even larger family you may want to double the recipe. We often also make brown and serve rolls with this meal, and also cook some green beans as a side dish. Quick, easy and the kids love it!